I love working with Keri Smith‘s How to Be An Explorer of the World in my academic research and writing classes because it helps me reinforce the scholar adventurer dimensions of field research and the noticing deeply needed for imaginative learning and precise writing. But having the students share their findings can get a little tricky, especially when I try to integrate the explorations into digital kinds of sharing–ePortfolios, blogs, discussion boards. I’m trying to get them outside to practice & cultivate a keener awareness of the often-overlooked details (and potential sources of inspiration and insight) in their everyday surroundings and then to use various tools–sometimes digital (e.g., phone camera), sometimes not (e.g., rubbings with crayons)–to preserve their observations. Thanks to one of my MOOC colleagues, I just found this blog post on Color Walking from RadioLab‘s episode on Color. Their multisensory exploration was inspired by William S. Burroughs’ Color Walking; Keri Smith recommends it also. What I’m loving especially is the way they used the timeline tool to plot their findings. This is so much better than attaching a photo to a discussion board posting, in so many ways. The timeline communicates the journey so much better and the inclusion of multiple images and short textual descriptions of each encounter with the image/color-source captures the interpersonal aspect of the trek. Sometimes the color is on a person, not an object, so they don’t just snap the photo but ask permission first and include a snippet of that discussion (or an acknowledgement of it) in their caption–reinforcing so many important learning objectives regarding citation and scholarship as conversation and so forth. I’m really jazzed. I was already planning to use a timeline tool in one of my classes–Tiki-Toki–but now I’m also going to look at the tool RadioLab used: Timeline JS. 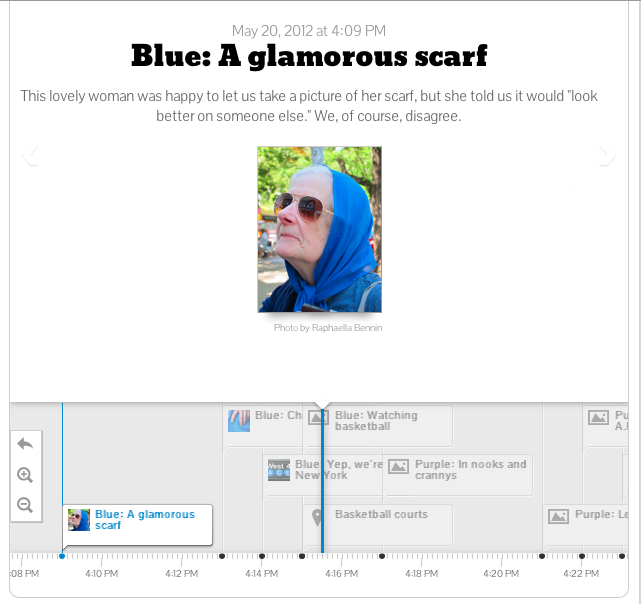 I can see the color walk assignment as a way to get the students comfortable with the timeline software in preparation for a larger, collaborative timeline we’ll be doing as a class. I’m also thinking about how the timeline tool might work with one of my favorite ice breaker assignments, a mad libs style exercise based on George Ella Lyon’s poem, “Where I’m From.” In it, students compose poems that are litanies of significant artifacts and names from their personal histories. I’m wondering what it might look like to translate those metaphors into images on a timeline–what would be lost and gained through that translation or remediation. This entry was posted in digital remediation, multimodal inquiry and tagged MOOC-EDC by Brooke Hessler. Bookmark the permalink. Thanks for mentioning timeline. This is new to me and looks interesting. As part of #edcmooc we need to create one? I guess I haven’t looked around enough to see what the requirements will be. Hi Dan, No I don’t think #edcmooc requires us to make one. I’m just experimenting with timeline software because I’ll be using it in one (or two or three) of my classes this semester. I’ve decided to go with the tiki-toki timeline product, which is different than the one used for this post. I’ll link to one of my experimental timelines soon. Such a coincidence to see you mention the How to be an Explorer book by Keri Smith, given that I teach IT at college so have no educational interaction with children, apart from my own. For Christmas my 14 year asked for this same book having stumbled upon it on the Internet. It’s not available in South Africa and no one here had even heard of it, so we had to order it and it arrived 2 days ago! She loves it! Very neat coincidence! Yes, it’s a marvelous book. I love all of Keri Smith’s books. How did your daughter hear about it? Is she a writer or artist?